KP’s Dual Sector Antennas are made up of seven models each having two or more sector antennas. Units are available with four or eight ports and support 2 x 2, 4 x 4 and 8 x 8 MIMO. The straight-on model antennas feature two forward-facing 65° or 90° sector antennas in single randome and come with frequency combinations of 2GHz/3GHz, 2GHz/5GHz, 3GHz/5GHz or 5GHz/5GHz. The side-angle antennas consist of two 65° sector antennas in a single radome and mounted 60° apart. EDMONTON, ALBERTA, CA - KP Performance Antennas, a manufacturer of WISP antennas, announced a line of high-gain, dual-band sector antennas for use in wireless networks. KP’s line of dual sector antennas is made up of seven models, each consisting of two or more sector antennas inside a single, rugged radome. The single mounting point of these antennas reduces inches on the tower, halves the tower rental costs and lowers wind resistance. They also provide a rapid upgrade path to add frequency bands without installing more infrastructure. 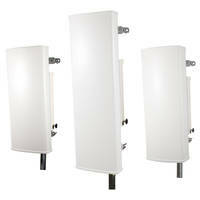 These antennas are offered with four or eight ports and support 2x2, 4x4 and 8x8 MIMO, depending on the model. The side-angle models combine two 65° sector antennas in a single radome and mounted 60° apart – Two ports are angled at -30° and the other two ports at +30°, for a total of 120° of coverage utilizing two 2x2 MIMO radios on a single antenna. These antennas achieve complete 360° coverage while minimizing interference with only three side-angle sectors connected to six 2x2 MIMO radios around a tower in frequency reuse ABCABC. These dual sector antennas are in-stock and can be ordered directly from the KP Performance Antennas website at https://www.kpperformance.com/pages/new-wisp-antennas-and-accessories/dual-sector-antennas.html. For inquiries, please call 1-855-276-5772.